Apple trees are an extremely common sight in the Vermont landscape, and really throughout most of the world. The beautiful pinkish white blossoms are one of the sure signs that spring is here and summer is on the way. Fruit slowly ripens throughout the heat of summer and is ready for harvesting in early fall. Many of us look forward to apple picking each year and of course the baking that results from each trip to the orchard. This fruiting tree originated in Asia and Europe, appearing often in both early religion and mythology. 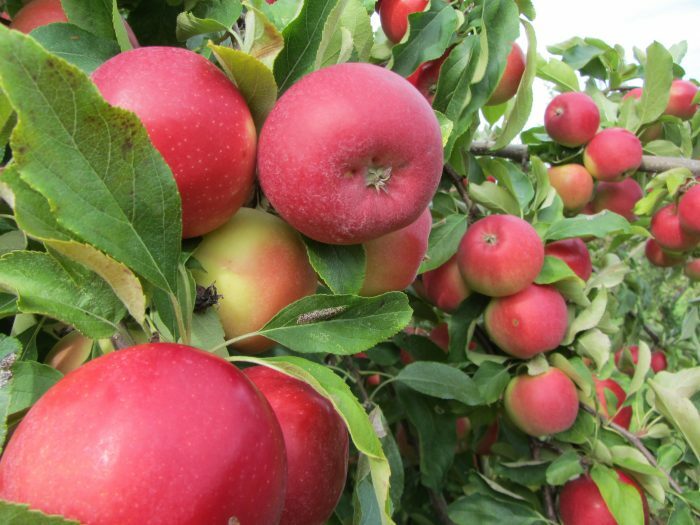 The earliest know apples have been traced back thousands of years. This tree was even deemed important enough to be brought to the Americas by early colonists. The small more bitter fruit was grown mainly for use in hard ciders, and were slowly cultivated into the tasty sweet eating apples we know today. There are now more than 7,500 known cultivars growing worldwide. For more fun Historical information check out the History Channels Hungry History. This ornamental and fruit bearing tree can be both grown from seed or grafted. Depending on the method of propagation you choose the tree will vary widely in growing habit from 6-15 feet tall. Pruning is also an important process for cultivating your trees for fruit. Timing and where to prune each branch are important as you want your trees to thrive. Click here to learn about proper pruning practices. It is said that eating an apple a day keeps the doctor away….but does it really? This healthy and nutritious snack is high in anti-oxidants, fiber and in vitamins such as A, B, C, and K. They are also said to aid in the prevention of Parkinson’s Disease, Alzheimer’s, and oddly enough tooth decay. They have also been said to aid in decreasing your chances of getting diabetes, suffering from strokes or even getting certain types of cancers. To learn more visit the American Institute of Cancer Research website.